'Centaur's Song' ( Elm Jensen, R. 2007). Seedling KSMWR1. AR (OGB), height 36" (91 cm), Midseason bloom. 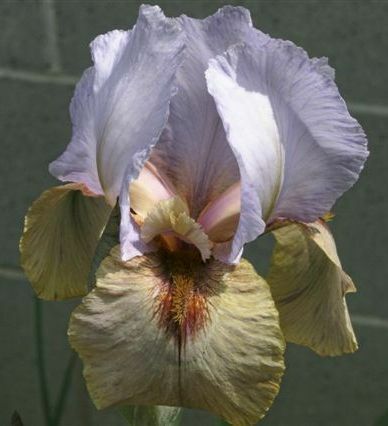 Standards light lavender veined green on midribs; style arms beige flushed lavender, crests beige striped lavender; Falls beige, brown haft veining, small round light brown signal becoming a darker line reaching to the tip of the petal; beards bronze; slight fragrance. 'King Solomon's Mines' X 'Welcome Reward'.